My warrior and the gnomeling’s shaman were happily and innocently leveling in Tanaris this morning, frolicking in the desert sun and generally minding our own business. Then along comes this lv 80 shaman helping a lv 40 bloodelf hunter quest, so what does the big strong tauren do? Naturally he pursues our lowbies and whilst Lylia being the self sacrifical sweetie he is, gave my mount waterwalking and told me to run for it, his ghostwolf couldnt escape from the shaman’s epic bear. To be fair, the shaman only killed him once and then left, allowing him to ankh but …..
Why did Blizzard put a portal in Dalaran straight to Tanaris if they didn’t want you to teach bullies in the desert a lesson? No the Caverns of Time is not the correct answer to the portal question btw. So we log off, log our mains and hurry off to do some sunbathing. Unfortunately it seemed that Mr hero shaman who bravely pursued two lowbies across the ocean, didn’t do so well in PvP versus a lv 80 warrior as he did versus a lv 46 shaman. In the same time it took Lylia to do 18k of damage, the shaman managed a mere 1k to him. I was a late arrival to the party so it wasn’t as if the shaman saw me and gave up, he was just a keyboardturning muppet who can’t fight or run away from a prot warrior. So where does the pyscho bit come in? Well Lylia spent the next 2 hours killing them in a variety of locations leaving a trail of skeletons all the way from the Lost Rigger Cove to outside Mudspocket. The moral of this is, there are always bigger fish with bigger teeth in the sea and even if you are the mightiest player on the server, sometimes you will be beaten via quantity which is one reason why we don’t gank unless provoked. Hopefully thats a lesson Mr Cow learnt tonight. 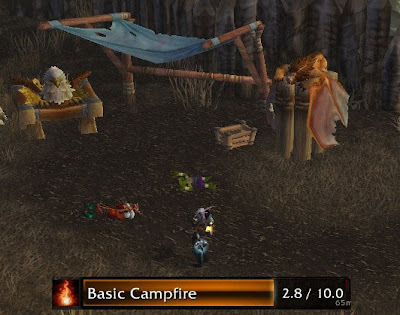 Edit: Lylia’s guide to successful camping – kill the flight master so your friends (victims) can’t leave. If you must make macros like this to be used at the start of Battlegrounds, make sure its all spelt correctly. Blizzard are highly unlikely to use “u” instead of “you”. Seen quite a few of these recently, all with really bad grammar/spelling, the worrying thing is each time its spammed into chat, at least one person leaves the battleground. Coincidence perhaps. Hopefully. On a slightly related note, got ganked by 3 separate 70s in the Searing Gorge today. Guess what they all had in common? Yep, all rated below 1550. So do high rated players not gank lowbies? Am I just meeting scrubs taking out their frustation on greys? Maybe I should make a “LF high rated lowbie gankers” forum thread to see if anyone holds their hand up and says “Yes, im a Gladitator and I gank low levels with pride”.